People who have classic cars go out of their way to baby them, to take care of them. It’s not just because they have a bunch of money invested in their classic ride. Classic cars have a special place in our hearts, in part, because they conjure up nostalgic memories of a time where (we remember) better days were ahead of us. Using the right kind of oil is an essential issue in the care of classic cars. The oils of today are very different from the oils a classic car would have used back in its first life. They have advanced additive packages that protect the engine and prevent harmful sludge formation in ways that oldtime oils never had the ability to do. And they’re only going to keep getting better. Ask the average person about the most significant advances in motor oil and they’ll probably say something about synthetic oils. That’s certainly one of them. The first synthetics were used as aircraft oils during World War II while Mobil 1 in the 1970s is generally considered the first large scale commercial synthetic oil for the automotive market (although some vehicles has been using certain kinds of synthetics as early as right after WWII). Synthetic motor oils are great – they resist oxidation and sludge formation better than conventional oils, (largely due to their highly refined base stocks), cope better with temperature changes and they lubricate some parts of the engine better than conventional oils. Because they are created in the lab instead of “pulled out of the ground”, their formulators have the ability to tightly control the composition of the oil – the kind and ratios of the different molecules in it. Which makes the oils better able to do what they’re supposed to. So it would seem that synthetics oils offer the perfect solution to the wants of classic car owners. Synthetic oils offer high quality, state-of-the-art protection for the engines they’re used in. Owners of classic cars want the best for their automotive babies. 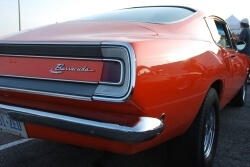 The natural question that follows is…..
Can You Use Synthetic Oil In A Classic Car? There’s a lot of debate in the classic car community about whether or not it’s a good idea to switch from conventional to synthetic oil in an older, classic car. And since synthetic oils are higher quality, you might be tempted to switch over. But there are some caveats for switching that have to do with the additives in the oil. It used to be that the experts would recommend, for any older vehicle, not to switch from conventional to synthetic. This advice was based on concerns about synthetic oils containing ester compounds that might interact adversely with engine seals in cars that were higher mileage, causing oil leaks. Today, these concerns aren’t really valid any more. Automotive experts now recommend that you can seamlessly switch from conventional to synthetic without worrying about oil seal wear. That’s what they recommend for “older” cars. What about classic cars? Classic car owners need to be sure they’re making the right decision when it comes to their classic car’s oil. Indeed, these experts have different recommendations for classic cars. Classic cars may still have potential issues handling the modern additives load that all synthetic oils come with. The detergent package is a key part of this. Modern oils are really good at keeping engine surfaces clean and clear of sludge buildup, in part because of their advanced detergent and dispersant packages. Classic car engines, with their old school lubricating systems, never had to account for the cleaning effects of their motor oils. In older cars made before 1990, they actually want some formation and buildup of engine sludge. Their oil seals and gaskets may not be as tight as in newer cars. Sludge will form over time in the engine environment and and collect along these areas, effectively functioning as a sealing mechanism. That’s a good thing. If the synthetic oil, with its advanced detergent package, is introduced into such a system, it will seek to clean out sludge from the engine, meaning there’s a chance it could remove some of this sludge that was acting as a seal. Now you have a potential oil leak. This possibility should not, however, stop you from considering a change from conventional to synthetic in your classic or older car. You just need to be prepared to keep an eye on your car’s oil usage after the switch. It may require you to change your oil more often. And no matter what, always change your oil filter during your oil change. This post was published on May 19, 2017 and was updated on September 14, 2017.